You can’t stand on Mars – yet – but you can at least get a sense of what it would look like, thanks to NASA’s Curiosity rover now exploring the lower slopes of Mount Sharp, a 5.5-kilometre (18,000-foot) tall mound of layered rocks at the center of Gale Crater. The rover recently wrapped up a year-long stay atop Vera Rubin Ridge and is now targeting a nearby trough, nicknamed Glen Torridon, where Mars orbiters have spotted phyllosilicates, clay minerals that formed in water. Before it departed Vera Rubin Ridge, Curiosity collected 122 images with its Mastcam camera that could be stitched together to provide a 360-degree panorama of its surroundings (a 230-megabyte version is available here). 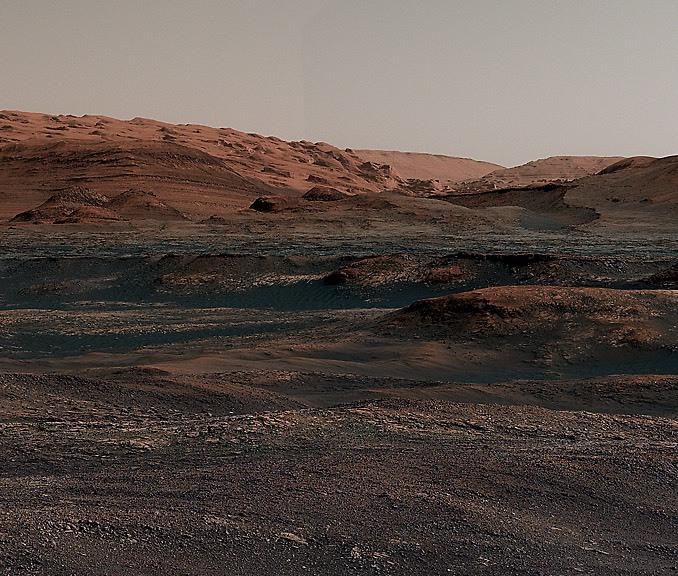 The view shows Glen Torridon and the upper reaches of Mount Sharp, nearby drill holes where the rover collected sub-surface samples, the floor of Gale Crater and a portion of its distant wall. Evan after a year of study, researchers have not yet pieced together how Vera Rubin Ridge formed in the first place, resisting erosion compared to surrounding bedrock. 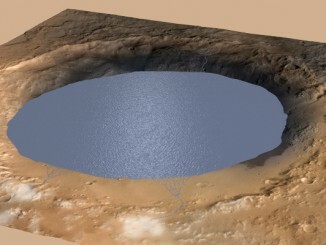 Curiosity showed the ridge is made up of sediments that settled to the bottom of an ancient lake and confirmed the presence of hematite as well as crystals indicative of the presence of water in the distant past. But the signs were found in patches, prompting speculation that ground water affected some parts of the ridge differently than others. On top of that, hematite signatures found by Curiosity did not necessarily match maps based on data collected from orbit. Curiosity landed on the floor of Gale Crater in August 2012. About one martian year – 687 Earth days – later, the rover finally reached the base of Mount Sharp and began exploring its lower slopes. 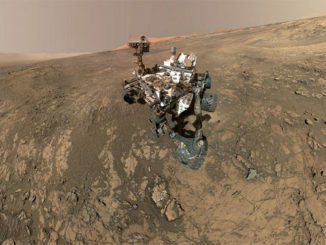 NASA’s Curiosity Mars rover acquired this 360-degree panorama as it neared features called “Murray Buttes” on lower Mount Sharp on the fourth anniversary of its landing. 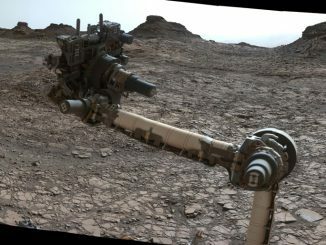 The Curiosity Mars rover used a camera on the end of its robot arm to take a selfie on the slopes of Mount Sharp before moving on to begin exploring nearby clay-rich soils. The rover is slowly working its way up the lower slopes of the mountain, looking for changes that might indicate the transition from warmer, wetter eras to the dry, frigid environment seen today.